Situated on the United States-Canada border, Waterton Lakes National Park in Alberta is the Canadian counterpart to the American Glacier National Park. One of the best things about this park is that it is much less crowded than its northern counterparts, Banff and Jasper. Filled with majestic views of the valley, the lake, and the surrounding mountains, hiking in Waterton Lakes is the perfect way to spend a weekend. Need some inspiration for which one to take on? 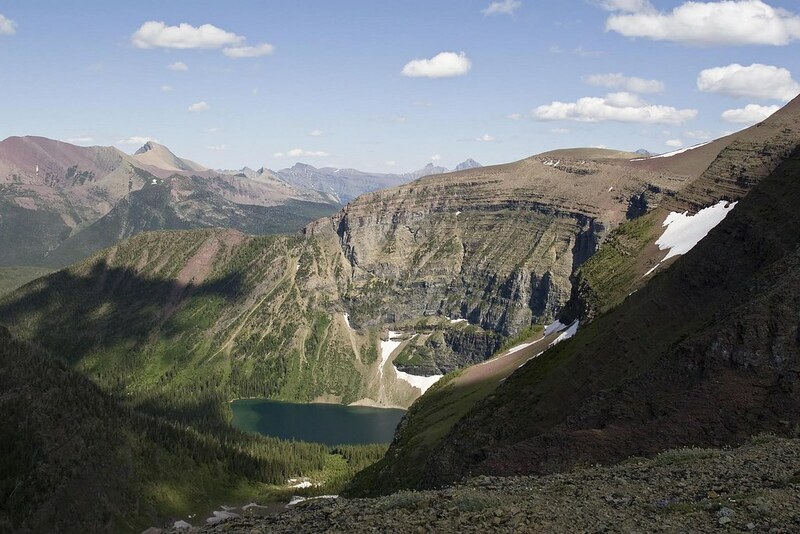 Here are 11 suggestions for some jaw-dropping hikes in Waterton Lakes. 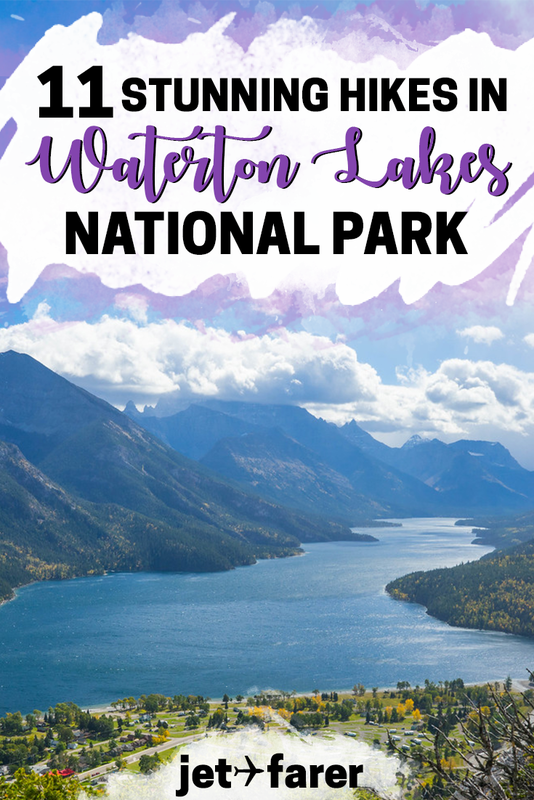 If you’re hopping over the border from Glacier National Park or simply driving down from Calgary, there are tons of amazing hikes in Waterton Lakes National Park. Read on to learn about some of our favorites. For those of you who only have a little bit of time to go hiking in Waterton Lakes, Bear’s Hump (pictured above) is the perfect trail. A gradual incline with a few switchbacks leads hikers up a hill to a rocky outcropping. From here, you can see out over the lake and across to the surrounding mountains. The viewpoint offers some of the most stunning panoramas of the area – just watch out for the wind! On the border of Waterton Lakes National Park and Akamina Provincial Park is the Wall Lake trail. To get here, you’ll park at the Akamina trail head and then follow signs to Wall Lake. This hike passes through forests and over creeks, eventually leading visitors through alpine vistas to the beautiful Wall Lake, which attracts mountain bikers and fishers alike during the warmer seasons. These trails are also home to plenty of wildlife, such as bears and wild goats, so be sure to come prepared for hiking in Waterton Lakes. Forum Lake is a turquoise alpine lake that’s hidden past a few kilometers of trail near the Akamina Pass, and is one of the most beautiful hikes in Waterton Lakes. Much like Wall Lake, the Forum Lake hiking trail also shares a trail head with the Akamina Pass. Once you’re on the trail, you’ll wander through mostly forested areas and a few open fields, passing some small creeks and waterfalls along the way. Keep going through the forest and continue to follow signs for Forum Lake. Once you arrive, you’ll find a serene lake surrounded by mountains – the perfect place to snack on some trail mix and admire the landscape. Located about 16 kilometers outside of Waterton Lakes town center, Cameron Lake is one oft he most gorgeous lakes in this park. Here, you’ll see visitors kayaking on the lake. However, if you’re hoping to hike, there are several trails around the Cameron Lake shore to explore. Come ready for an adventure fit for all levels of hikers! For those people who love chasing waterfalls, Blakiston Falls is one of the most spectacular (and beginner-friendly!) hikes in Waterton Lakes. 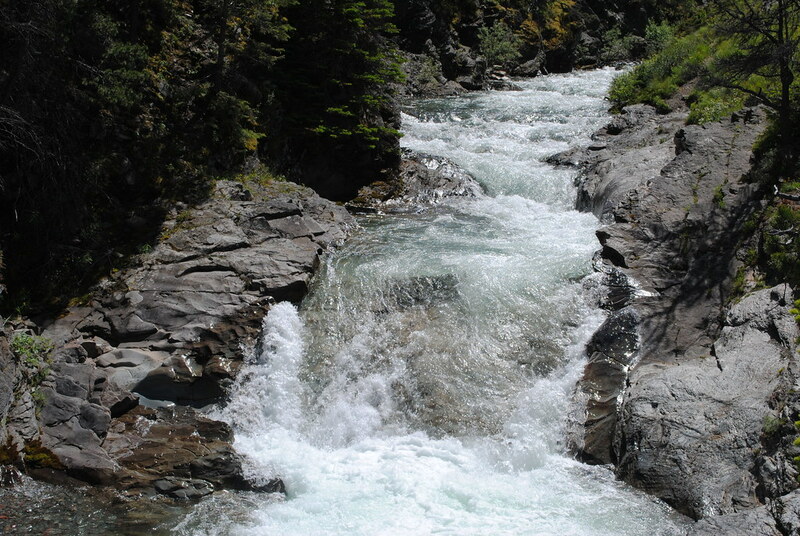 Featuring a beautiful waterfall with a backdrop of jagged mountains, the short trail to Blakiston Falls is mostly flat. You’ll pass through verdant coniferous forests and vast, open areas with spectacular glimpses at the surrounding mountains. At the falls, you can relax for a bit and admire these perfectly-placed waterfalls amidst the grandeur of the mountains and the shade of the forest. One of the most beautiful and rewarding hikes in the entirety of Waterton Lakes, Upper Bertha Falls is one that should not be missed. With a 10.3 km trail that boast spectacular views of the nearby forests, mountains, and lakes, the main highlight of this trail is reaching the falls – a spectacular cascade of water down the rocky mountainside. 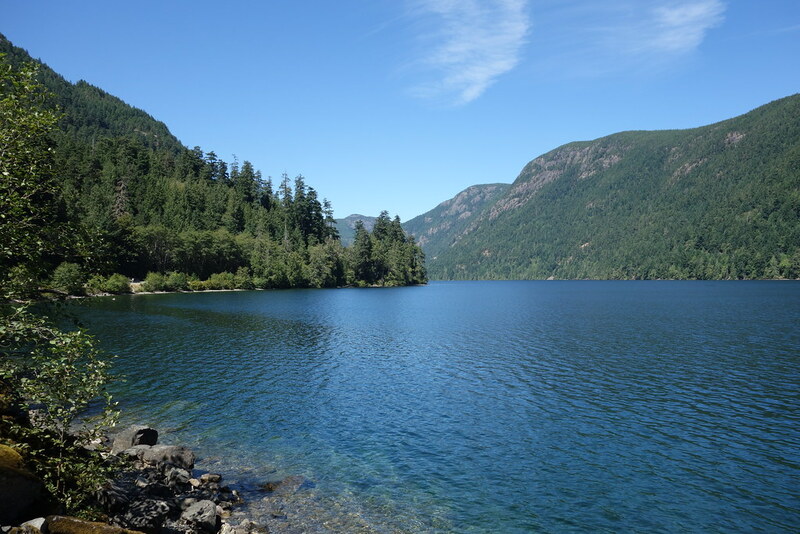 Bertha Lake is yet another beautiful, turquoise lake located at the foot of some mountains, and this hike is a great way to spend an afternoon in a variety of terrains. No list of hikes in Waterton Lakes should leave off this hike through a unusual, red landscape amidst the usual greens, blues, and grays of the Canadian Rockies. 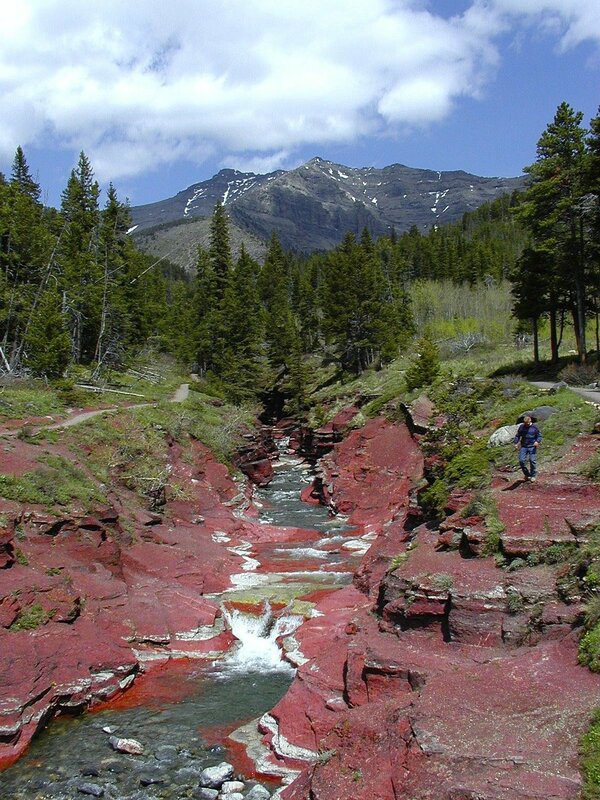 True to its name, this canyon runs through a wooded area and is composed of reddish, stratified rocks. This is a very short hike and is very suitable for beginners, and is a very interesting, unique, and colorful view of Waterton Lakes. If you’re looking for a stunning hike with incredible panoramic views of the valleys below, Lineham Ridge is perfect for you. Beginning at the Rowe Lake trail head, it’s a challenging day hike with summit views well worth the effort. You’ll start hiking through the evergreen forest, but eventually will hit a scree field that leads up to the summit. Be sure to leave practically a full day for this one – you’ll want to take your time near the lakes and at the summit to soak in the breathtaking views. Are you an ambitious hiker who is up for a serious challenge? Register for the Triple Crown, a series of 3 famous hikes in Waterton Lakes. To *officially* enter, head to Pearl’s Cafe and register with your name. If you finish all 3 hikes, you can join the list of finishers and have ALL the bragging rights. Before you decide to embark on this challenging journey, here’s the low-down on the three trails that form the pinnacle of hiking in Waterton Lakes. 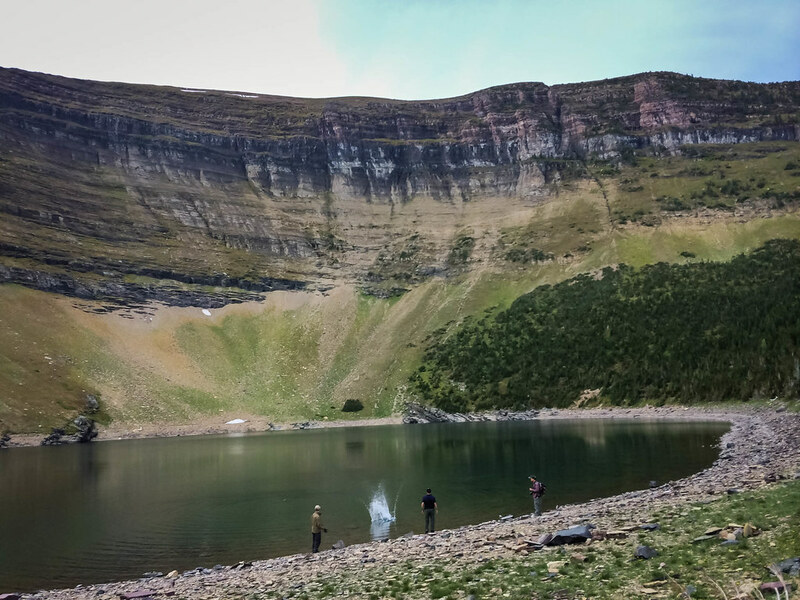 Located right on the United States border, Crypt Lake is one of the best trails for hiking in Waterton Lakes. To get to the trail head, you’ll have to take a boat from the Waterton Lakes Marina ($20 CAD). A fairly challenging hike, this trail is an out-and-back that passes through forests, waterfalls, and finally, gives way to a beautiful lake with spectacular mountain views. And, to add a bit of challenge, along the way, there are some obstacles that involve crawling through tunnels, climbing ladders, and crossing a cable line off a steep cliff. Not for the faint of heart! Perhaps the single most spectacular trail for hiking in Waterton Lakes, the Carthew-Anderson Trail features some of the most amazing vistas of the park below. Passing by a handful of peaceful lakes, beautiful alpine meadows, and green forests, it’s definitely worth the almost 20-mile trek. From the Carthew summit, you can even see into Glacier National Park and some of its jagged peaks. This is a challenging hike, but if you’re going to do only one of the three Triple Crown hikes, this would be it. Although the Akamina Ridge trail isn’t *technically* in Waterton Lakes, we’ve included it here because it provides stunning views of the park and the surrounding areas. It begins on the same trail as the Forum and Wall Lake hikes. On this hike, you’ll pass waterfalls, tranquil lakes, and a vertical rock scramble or two before you reach the summit. On the ridge, you’ll spend over 5 miles hiking along this stunning panoramic area, with views down into the turquoise lakes below, and the snow-capped surrounding peaks. You can even see down into Glacier National Park in the United States. 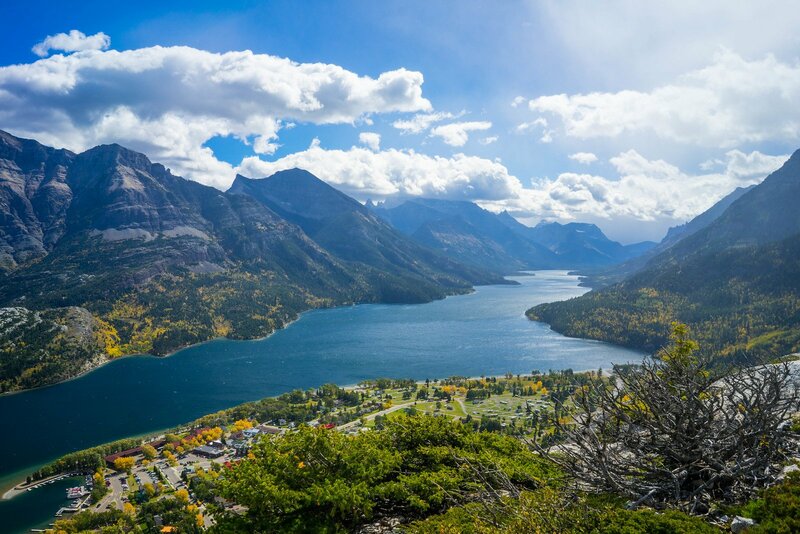 Have you ever visited Waterton Lakes? What was your favorite hike there? Share your thoughts in the comments!